Marvelous painting by an obviously talented lady! 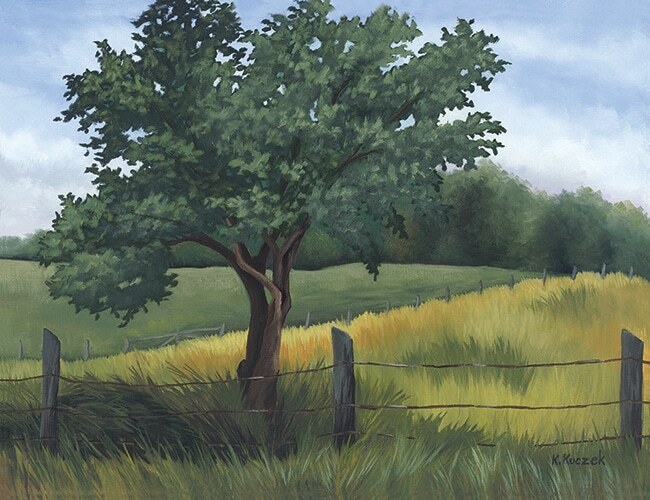 Ann Bowen – For Plein Air I use oils. I am not quite to the point of finishing on site but I am getting close. It is challenging but so much fun! Find a group or start your own – get out there and paint – you will love it! Hi Kathy, are you outside painting this year or have plans? I know you are taking it easy a bit, but your brain never stops if I remember you correctly. I love the painting you show from last July. You are so tremendously gifted. Maybe I should trek on up to the north woods and you could share some of your expertise? What do you say, cous? Hey Cynthia — You remembered right — my brain never stops. Thanks for the compliment on the painting. I was pretty happy the way it turned out. I learned a lot last year and am anxious to start doing the plein air again. There are so many great places to go around here. It is challenging but so fun! Yes we have to paint together when the weather warms up. !